and you suddenly blank out! Somehow everything you’ve studied runs right out the back of your mind and you panic. Maybe it comes back to you as you calm down but you’re already agitated and have lost precious time to answer all the questions. This article is for the average student who experiences the average level of panic on exams. I’ve been there, successful orgo study hall members have been there, and chances are you’ve probably been there—in panic mode at the beginning of a test. Blanking out and panicking during an exam can stem from various sources, but I find that the primary causes are a lack of adequate sleep (usually from staying up all night trying to cram information into your head) and a lack of confidence. You can read more about managing your study and sleep hours in my “Avoid Orgo Burnout” article. And I’ll address here the lack of confidence factor, which I consider to be the second biggest cause of blanking out. Think back to the last time you had to memorize something important, like your new cell phone number, new address or credit card number. You think about it, search the depths of your mind and slowly you are able to recall the first few numbers, but that’s it. You know you’ve memorized it but you simply can’t recall it upon demand. So you refer back to the written version. The next time someone asks you for your new cell phone number you DO recall all 10 digits, however it still takes you some time because each number is a separate task on your memory. That’s because you are still not familiar enough with the information. Once you’ve had your phone number for more than a few months, or lived at your current address for some duration, if someone asks you for your phone number or address you can probably spit it out in your sleep. You don’t need all of your concentration and you don’t have to think too hard about it. Why? Because you’ve typed it and written it and said it so many times it’s second nature to you. Great! So how does this relate to blanking out on your organic chemistry exam? Your final exam covers multiple chapters with dozens of reactions and concepts in each chapter. How much time did you really spend on every aspect that you studied? Did you read the chapter, read your notes, work through and rework every problem? Therefore, because you’re not as familiar with the material as you feel you should be, your brain has to search the depths of your memory for the answer to a specific question. But if your brain is not comfortable doing this you panic. How you handle the panic is different for every student but for many students this is the source of blanking out. Back to your phone number. No matter how many times you say it and repeat it, you only really learn it when you’re tested on it. When someone springs the question, “What’s your phone number?” and you’re forced to recall it when you’re not ready. That’s how you get used to recalling the information. So just reading through your textbook one more time won’t do it. Even if you read your notes, rewrite your notes and reread your notes—these are all review actions. In order to get your brain into “recall mode,” or the habit of recalling, you have to force it to recall. And that’s where practice comes in. After you complete a chapter do practice problems and then do some more and still more. I still want you do to 20, 30 even 50 questions per chapter. Do the question, learn from your mistakes, and do a few additional difficult questions. Get used to getting caught off guard on the material. Look out for tricks or small nuances that might make a particular question tricky, and get into a groove, a comfort zone of sorts, when it comes to tricky questions. By doing so, not only will you feel much more comfortable, confident and less likely to blank out when faced with difficult questions but you’ll also have done SO MANY PRACTICE QUESTIONS that by the time you get to your exam they’ll actually look FAMILIAR! So many professors will simply take a peek at the textbook and use the homework questions as inspiration for writing their own exams, and that’s if they don’t outright copy the homework questions. Consequently, in addition to boosting your confidence, the questions will look familiar and you’ll recognize the tricks. This level of extra confidence will ensure that you don’t panic when you see the exam questions. And if you’re confident instead of panicky, you are much less likely to blank out on your exams. If the process feels daunting, use the Start and End with a WIN technique to keep your head in the game. Where do you get those practice questions? Start with your orgo textbook. Work on both in-chapter and end-of-chapter practice questions. If you’re gearing up for final exams then check out my Orgo 1 and Orgo 2 cumulative final exams. With 35-40 questions at the medium to tricky level you’ll learn how to think on your feet and rationalize quick answers despite being under the pressure of a timed exam. In short, in order to become as familiar with the material as you possibly can be and therefore the most confident you can be for your final exam, you must train your brain to recall information and recognize tricky questions throughout your studying process. Do you blank out on exams? If so do you think it comes from lack of sleep, lack of confidence, or something else? Let me know in the comments below. leah ! i dont know what to say but lemme try it for my MCQs exams after 2 months , do you help me ,HOW CAN I COVER MY COURSE IN SHORT TIME ? 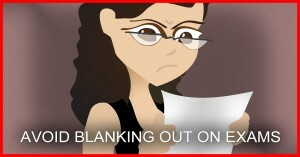 Great tips to avoid blanking out during final exams. Personally, I noticed that a lack of adequate sleep really affected my testing performance. Freshman year of college, I would stay up extra late to study for exams. By the end of sophomore year, I learned to study earlier in the week and go to sleep early the night before an exam. It really improved my GPA. Just simple. Do hard work study with interest and get marks. If you write right then there is no need to afraid of blanking. If a writer knows the answer then he/she will automated fill the answer sheet. Hi Leah, I’m truly agree with you practice is the key to confidence and success. I enjoyed reading your blog post. Excellent article! I am going to share it with students I tutor that are preparing to take an entrance exam for nursing school. The rest looked great. I kept hearing things I say to my students in what you were saying. I am now seriously considering purchasing a subscription to access your resources in order to augment my own tutoring. I like your style! Both of those as well as nerves. Obviously one want to at least pass to progress onwards towards one’s dream career. However if one does not this can have all sorts of implications such as financial (cost of doing the unit again and having to endure being student for longer than intended); and social fracture (having to ‘stay back’ a year while your buddies move on which can sometimes have associated negative connotations related to supposedly being intellectually inferior etc.). Nolan, it sounds like you’re psyching yourself out. Instead focus on the benefits of practicing and doing well. If you ACE your course you don’t have to pay the cost of taking the course again and you won’t have to stay back while your buddies move on. How does that sound?